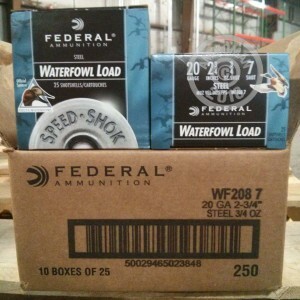 This 20 gauge ammunition from Federal is a great choice for waterfowl hunting. Each shell in this box of 25 fires a 3/4 oz. payload of #7 steel shot at a muzzle velocity of 1,425 feet per second. Federal Speed-Shok shells are an economical waterfowl load with a high quality flanged wad that helps keep pellets nice and round for superior patterning. This ammo is loaded in Anoka, Minnesota. Going on a big duck hunt? Stock up at AmmoMan.com, where all orders over $99 come with free shipping!